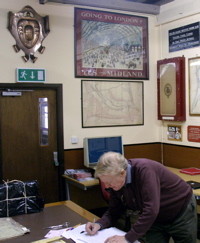 The Midland Railway Study Centre houses the largest publicly accesible collection of Midland Railway ephemera and documentation. The Study Centre is brought to you by: The Roy F. Burrows Midland Collection Trust, The Midland Railway Society and Derby’s Museum of Industry and History. The Study Centre is located within Derby’s Silk Mill Museum on Full Street and is home to the collections of Midland Railway ephemera and artifacts of the three organisations. The result is the largest collection of publicly accessible Midland Railway material anywhere. The collection of the RFBMCT, which comprises around 10,000 individual items alone, forms a very large part of the Study Centre’s holdings. Meanwhile the Derby Museum has amassed a large collection of its own — very little of which has previously been on public display. The Study Centre therefore provides the opportunity for the Museum to celebrate the Company which so fundamentally shaped what became the City of Derby. A great deal of the collection consists of “three dimensional” objects. This ranges from cast iron signs, through signaling material (nameboards, box diagrams, signal arms and even a signalbox stove!) to silverware and crockery from hotels, dining cars, and steamships. Regrettably, lack of display space means that this part of the collection is not ordinarily on show to the public. However, items can be made available for viewing by special arrangement. For more information about the Study Centre and for details of how to visit it please consult the Midland Railway Study Centre’s own website.